OPPO, a leading producer of smart phones, chooses Planet Idea as a partner to create the first “smart” Christmas tree. 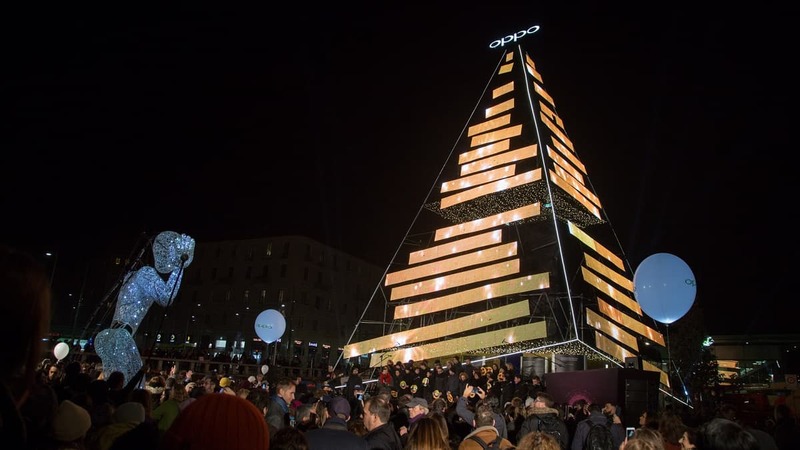 It’s called OPPO Xmas Tree and is located in Piazza XXIV Maggio in Milan. The 20 m tall tree has a unique design and the colorful lighting installation uses an energy efficient LED system. The initiative is meant to enhance one of the most popular meeting places in the city. Until January 6, 2019 it will be possible to enjoy an interactive and inclusive experience. The public will be able to enter the tree and interact with the different solutions studied by Planet. Citizens can make use of the free wifi, send digital greetings to friends and relatives from dedicated stations, recharge their smartphone with bicycles, and step on the solar bricks installed in the pavement. Planet Idea has integrated the smart solutions based on four dimensions: ecosystem resources, built environment, technological systems, and society. In addition to the free wifi, charging bicycles, and solar bricks, the installation also includes smart gym equipment that produces electricity, multi-sensor street lamps, and a dedicated neighborhood App.